Norwesco Industries was established in 1961. We are a 100% employee owned and operated Alberta based company, and our employees have well over 400 years of combined experience. OUR COMMITMENT TO YOU, OUR CUSTOMER, IS SERVICE AND DEPENDABILITY. We serve a wide variety of clients in such diverse industries as: FORESTRY, PULP & PAPER, PETROLEUM, MINING, CHEMICAL, FOOD PROCESSING, MANUFACTURING, and many others. Norwesco Industries is very pleased to be awarded distribution for Brennan Industries instrumentation fittings and valves. Brennan Industries is a well respected manufacturer of industrial flow control fittings & adaptors and recognized globally for its quality products. Brennans instrumentation division provides a broad range of nationally CRN approved Valves & Fittings to suit the diverse applications for today’s industrial requirements. This combined with a complementary range of tubing, associated accessories, hydraulics, hoses and the other long standing product offerings make Norwesco your choice for one stop shopping. Norwesco Industries carries such a wide selection of products for a large spectrum of industries and applications that some of the products and services we offer are either difficult to categorize, or stand out versus other manufacturers comparable products. The items featured in this section are some that we feel are exceptional in not only quality, but their ability to solve difficult situations with dramatic results. For more information on any of these problem solving products contact our inside or outside sales representatives to learn how Norwesco can help. Norwesco Industries is proud to be a distributor for Argonics Engineered Polyurethane, one of the premium North American manufacturers of polyurethane products. With a full line of ready to install concrete mixer liners for manufacturers including Con-E-Co, Erie Strayer, Helco, Inventure, Johnson, McNeilus, Rexcon, Ross, and Vince Hagan mixers. Argonics Kryptane® Evolution™mixer drum liners are the industry standard. Norwesco Industries also stocks Argonics weldable urethane sheets, 1/2″ x 4′ x 10′ which can be easily customizable on site to suit any application where structure is being worn away by abrasives or product flow. Extremely easy to install with tack welding, Argonics Weldable urethane sheet can, and will, solve some of those difficult wear areas causing you time and money. Norwesco is proud to offer this truly dynamic line of flexible Energy Chains. This product is used to contain electrical wires, fibre optics, hoses, tubing or any other flexible parameter. Predominately this product is seen in all automated systems where containment of wire bundles, and hoses are moving back and forth, such as wood automated wood working equipment, lathes, robotics, and CNC machines. Available in a multitude of sizes to accommodate bundle heights and widths, bend radius and lengths. A proven engineered product offered to increase reliability in any automated system. Igus also offers specialty plastic style bearings and slides for linear systems. Their registered trade marks include iglide, Drylin and igubal spherical bearings. These products are used on rotating and telescopic shafts round or flat. Special compounds of different plastics offer solutions for virtually any environment in both of these product lines. Is the industry leader in the manufacturing of high value, end use, recycled tire rubber products in Canada and throughout the world, and can be utilized in a wide variety of applications and environments. Their cutting edge products are specifically designed to cater to the residential, commercial, and agricultural markets. The versatility of the product allows it to be used inside and outdoors, and is suitable for use in all seasons and climates. Products are currently available to resurface wood & concrete, walkways/decks/patios, pools & hot tub surrounds, stairways, entranceways, and playgrounds. There are numerous patterns, colors, and configurations that are available ensuring that you find exactly what you are looking for. We are proud to be associated with a company that has such a diverse product line that allows us to offer our customers a solution for almost every situation, making Eco-Flex a great choice for your next project! Norwesco Industries has been involved in the supply and manufacturing of a wide variety of slide bearing pads since 1989. The concept of the slide pad is simple. Two surfaces with low coefficients of friction are allowed to slide against each other. The upper pad is larger than the lower pad, this insures the bearing area remains constant. 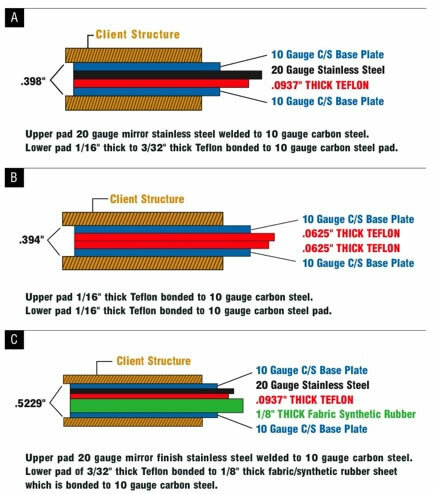 These slide pads are attached to steel plate, which are fixed to a wide variety of structural or piping applications where they must accommodate for thermal expansion, misalignment and adverse rotation. The materials chosen to perform this function must exhibit the following characteristics, correct chemical compatibility, temperature resistance and a low coefficient of friction. This explains why the most popular contact surfaces used are Teflon and mirror finish stainless steel. A number of different styles of pads are available but the most common configurations are seen in the drawings A, B and C.
A number of methods of attaching the slide bearing pads are available to accommodate for simple installation. Welding is the most popular, followed by mechanically fastening and cast in place. Note: Caution must be taken when tack welding a Teflon steel pad. The heat transfer may result in the delaminating of Teflon. The materials required to manufacture the common configurations of slide pads are stocked at Norwesco and result in excellent delivery, generally 6-7 working days. We at Norwesco acknowledge additional information may be necessary for you to determine which type of slide pads would be optimum for your application. We would be pleased to forward literature and or arrange consultations with one of are representatives. We supply bearing pads from sheet stock in ashto specifications or molded in grades up to natural grade 5. As per specifications such as metal shims molded in or teflon slider tops or pintle holes for alignment. For molded bearings we do require an engineered drawing to proceed. If you have a problem with heavy equipment resonating harmonic vibration to its foundation Tico Pads could be your answer. The advantages of this cork and rubber composite material are many ranging from ease of installation, elimination of floor damage and noise reduction. Tough and oil, water and cutting fluid resistant with long life and minimal maintenance make this material the best candidate to solve your machine mounting problems. Available in variety of thicknesses, widths and lengths. Chemical Resistance is available upon request. This material is considered the standard in the most demanding conditions. With high compressive stress capability, 1500 psi , this material is used in slider bearing pads in the Energy and Petrochemical industries and heavy machinery vibration dampening. Norwesco is stocking 1/16” and 1/8” thick material in a 48” wide. If different dimensions are required material is stocked at the factory. When specific information on the capabilities of this material is required we would recommend you contact one of our inside sales representatives. Yellowmine pipe is manufactured from a specially formulated PVC compound. The compound contains impact modifiers and ultraviolet inhibitors. The Certa Lok joint system enables a non corrosive restrained joint system that utilizes precision machined grooves on the pipe and inside the couplings. This system allows for a spline to be inserted locking the pipe and coupling together. A flexible elastomeric O-ring provides a hydraulic seal. This system enables fast assembly. It also provides the user disassembly, allowing for system changes or portability. The Certa Lok joint can be used in above and below ground applications. A full range of adapters is available to construct virtually any configuration. Elbows, flange adapters, threaded adapters. This piping system is available in 2” to 16” diameters. A proven industrial performer used in applications such as slurry lines, effluent and reclaimed water lines, permanent and temporary potable water lines, Sewer applications, process-piping etc.